Mission: Queens College prepares students to become leaders of our global society by offering a rigorous education in the liberal arts and sciences under the guidance of a faculty dedicated to teaching and scholarship. Students: 16,680 undergraduate students; 3,186 graduate students; Queens is one of America’s most culturally diverse colleges. Students trace their ancestry to over 150 countries and speak more than 70 languages. Faculty: 596 full-time faculty members; close to 85% have the terminal degree in their fields; 65% have tenure. Admission Requirements: Undergraduate admission is based on high school grades, academic program, and SAT or ACT scores. New York State GED recipients must earn a score of 350 or better on the equivalency exam and corresponding high school units. Tuition: For New York State residents, yearly tuition is $6,730 for undergraduates and $10,770 for graduate students. For out-of-state and international students, tuition is $600 per credit for undergraduates and $830 per credit for graduate students. Financial Aid: More than 60% of the College’s students receive need-based financial aid in some form: scholarships, work-study, or loans. The working world has never been more competitive. Evenentry-level jobs often require additional credentials. In some careers, certification or a master’s degree is essential to set yourself apart from the crowd. Consequently, you want to learn from top scholars in the field you plan to pursue. You want courses that meet at times convenient to your schedule. And you want to graduate knowing you won’t be paying off student loans for years on end. At Queens College (CUNY), you’ll quickly realize you’ve come to the right place. With our rich array of graduate programsand resources, we’re here to help you build your future. Our professors are newsmakers, award winners, acclaimed scientists, and thought leaders. They include notable authors, leading media theorists,and renowned artist-activists who have been honored with Fulbright and Guggenheim Fellowships, National Science Foundation awards, and grants from Google, IBM, the National Institutes of Health, and the Departments of Education, Energy, and Defense. Perhaps most importantly, our faculty “preach what they practice.” They are active scholars in their fields—as artists, educators, scientists, psychologists, counselors, and researchers—so you’ll have the benefit of their extensive hands-on experience. No matter your chosen field, you’ll be taught by experts who can help you gain the experience and critical-thinking skills you need for success. If you’re on the path to a doctoral degree, a master’s from Queens College can smooth the way. Approximately 70% of our professors hold appointments at the Graduate Center, CUNY’s doctorate-granting institution. Two Psychology doctoral sub-programs—Behavior Analysis and Clinical Psychology—are based on our campus. Many students in lab-based doctoral programs in Biology, Chemistry and Biochemistry, Environmental Science, and Physics conduct research here and do dissertations guided by our faculty. Queens College offers over 100 degree and certificate programs, including many you won’t find at other colleges. Our Education programs are highly renowned, as we have graduated the most teachers, counselors, and principals in the metropolitan area, cementing our major role in “educating the educators.” We offer the only master’s in Science Education in New York State for teaching both mathematics and computer science in secondary schools. Our highly selective Speech-Language Pathology program—which includes on-campus clinical work with clients at our Speech-Language-Hearing Center—is widely recognized as one of the best programs in New York State. Our professional Master of Science in Photonics, the first such curriculum within CUNY, trains students for jobs in the booming technology sector. The accelerated master’s program in Data Analytics and Applied Social Research allows you to earn a degree in three semesters. Our nationally recognized School Psychology program is one of the only programs in the United States with a focus on multicultural issues. Our programs in Accounting and Risk Management provide crucial preparation for the business world. And our innovative Master of Arts in Media Studies is designed for students who want to address social and political issues. Learn more about all our graduate degree programs at qc.cuny.edu/graddegrees. We make it easier for you to earn your degree by scheduling most of our classes in the late afternoon or evening. Our summer sessions and online courses offer further flexibility for completing your studies. And if you’re raising a family, you can take advantage of our professional Child Development Center, which provides inexpensive day care. New York State residents pay $455 per credit with a maximum of $5,385 per semester—one of the most affordable graduate tuitions in the nation (2018–2019 school year). Indeed, Queens College was hailed as a “best value”college by Forbes and named a “best college” by Money magazine. All of which means our students graduate with a fine education—and without a heavy burden of debt. On-campus housing is available at Summit Apartments, our beautiful residence facility that has areas reserved exclusively for graduate students. Summit Apartments—with fully furnished private suites and two- and four-bedroom suites—have study lounges, a fitness center, laundry facilities, high-speed Wi-Fi, basic cable TV, and music practice rooms. Learn more at queenscollegehousing.com. 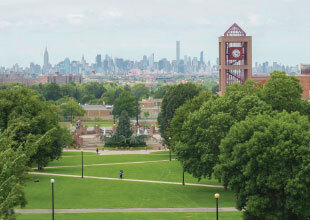 Located on a quiet, tree-lined 80-acre campus, Queens College offersa wealth of resources. The Rosenthal Library holds more than 1.2 million hard-copy and electronic books and has access to over 92,000 periodicals.It boasts an art library, music library, innovative retrieval systems, and extensive digital microform, governmental, and specialized resources. Other college facilities range from state-of-the-art science labs and art studios to practice rooms equipped with Steinway pianos. Additionally, as a graduate student, you will have access to lounges, cafés, dining halls, and athletic facilities (including our Olympic-size pool, afully equipped Fitness Center, and indoor and outdoor tennis courts). And, of course, we’re only 20–30 minutes from Manhattan and its countless research, employment, and cultural opportunities.